AUCTIONSPLUS’ online sheep and lamb clearance rate jumped last week after significant falls of rain across parts of New South Wales. The online auction platform said the overall clearance rate lifted about 10 percent to 71pc, with the sheep and lamb listing remaining steady at 57,187 head, up 71 head on the previous week. Significant rainfall across some parts of NSW coupled with promising rain forecasts for the coming week encouraged buyers and the clearance increased, AuctionsPlus said. The Tuesday National Sheep sale was bolstered by a flock dispersal of 5736 head from Angip Nominees at Navarre in Victoria. New South Wales operators bought and sold most sheep and lambs offered on AuctionsPlus last week. NSW producers offered 32,929 head, down 5274 on the previous week. The number offered in Tasmania also fell by 682 to 934. But the listings increased from all other states – including in Queensland, up 3693 to 7134; in South Australia, up 2074 to 4943 and in Victoria, up 380 to 11,247. Stock sold into NSW included 6903 on the central west, 4277 to the Roverina, 3578 in to the southern tablelands, 3470 to the south-west slopes and plains, and 2826 into ‘metropolitan’ NSW. Buyers in northern Victoria bought 6166 head. Scanned in-lamb Merino ewes sold from $131 to $202.50, averaging $161. The top price was paid for 198 two year-old early February shorn Merino ewes in the Angip Nominees’ flock dispersal. The Charinga blood ewes weighed 52.8kgs, were mostly score 3 in condition and scanned 100pc in-lamb to Border Leicester rams. They were sold to a buyer 2.5 hours to the west at Apsley in Victoria. At Trangie in New South Wales, 180 16-17 month-old early December shorn Merino ewes scanned 100pc in-lamb to White Suffolk rams sold for $135. The ewes weighed 42kgs, were score 1 in condition. Unjoined Merino ewes sold from $79 to $130, averaging $101. From Tarcutta in NSW, 285 mid-March shorn rising three year-old Merino ewes sold for the top price to a NSW buyer. The Pastora blood ewes weighed 46.6kg and were score 2 in condition. At Albert in NSW, 200 rising five year-old mid-February shorn Merino ewes weighing 58.1kg and score 2 in condition sold for $106. 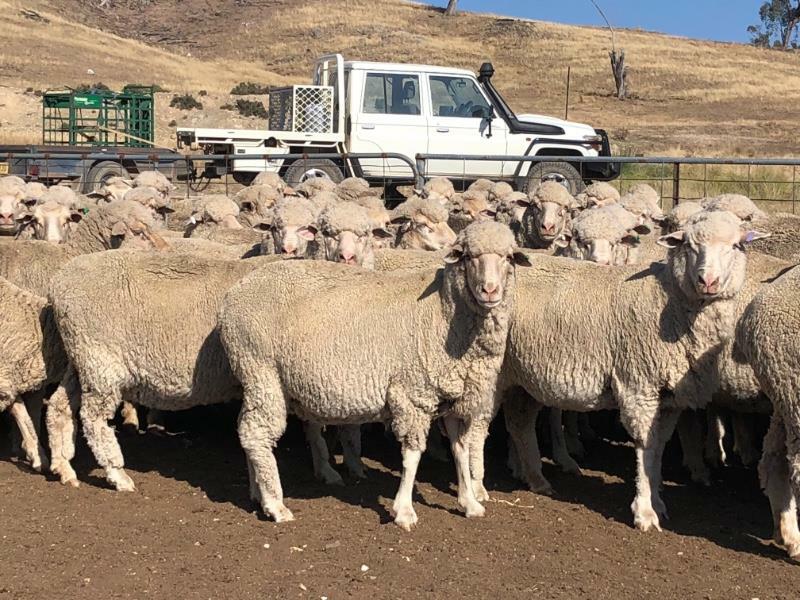 Unjoined Merino ewe hoggets sold from $80 to $116 to average $106. The top price was paid for 250 SRS-bred late-January shorn Merino hoggets at Dubbo, NSW. These 16-20 month-old hoggets weigh 44.4kgs, were score 1 in condition and sold to a NSW buyer at Guyra. A line of 365 18-19 month-old Merino ewe hoggets at Burren Junction, NSW, sold for $107. The average price of Merino ewe lambs increased by $20 to $113, with lines making $70 to $157. At Mundoora in South Australia, 234 June-July 2018 drop late December shorn Poll Merino ewe lambs sold for the top price to a Kadina buyer. The lambs weighed 42.7kgs and were mostly score 2 in condition. At Deniliquin in NSW, 205 June-July 2018 drop Poll Merino ewe lambs were bought for $90.50 by a buyer at St Arnaud in Victoria. Merino wether prices also increased online last week, lifting $37 to average $97, within a range of $66 to $125. The top price was paid for 430 3-5 year-old mid-August shorn Merino wethers at Yass, NSW. These 53.2kg Tallawong blood wethers were mostly score 2 in condition. In the Angip Nominees’ dispersal, 300 two year-old Charinga blood Merino wethers sold for $78. Merino wether lambs sold from $41 to $110.50, averaging $74 last week. The top price was paid for 295 unshorn July-August 2018 drop wethers at Yass in NSW. The Bogo blood lambs weighed 35.3kg and were mostly score 2 in condition. At Albert in NSW, 200 September-October 2018 drop Merino store wether lambs made $73. Scanned in lamb first cross ewes averaged $228 and sold from $125 to $271 on AuctionsPlus last week. The top price was paid for 168 2.5-3.5 year-old late September shorn ewes at Buangor in Victoria. The ewes scanned 143pc in-lamb to White Suffolk-Texel rams. They weighed 68.1kg, were mostly score 3, and sold to a South Australian buyer at Millicent. At Cowra in NSW, 213 scanned three year-old ewes made $200. The ewes weigh 70kgs and were joined to White Suffolk rams. First cross ewe lambs sold from $120 to $160, averaging $137. The top price was paid by a Narromine buyer for 170 unjoined 11-12 months mid-September shorn ewe lambs at Dubbo in NSW. 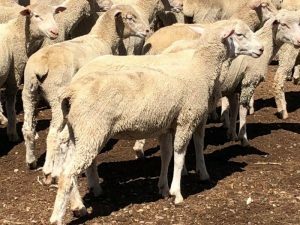 At Tottenham in NSW, 540 August 2018 drop ewe lambs weighing 32 kgs sold for $133 to a buyer at Wycheproof in Victoria. These Poll Dorset cross lambs sold for $125 at Coolac, NSW. on AuctionsPlus last week. Crossbred lambs sold from 251-355c/kg live weight online last week, averaging 322c/kg. The top price was achieved by a line of 320 August-September 2018 drop early January shorn Poll Dorset cross lambs at Coolac in NSW. The lambs weigh 35kg lwt or 16.5kg cwt and sold for $125 to a buyer at Moss Vale, NSW. AuctionsPlus last week interface with the Jamestown Store Sheep Market that offered 3019 head. The top price was of $220 was paid for 126 two year-old mid-January shorn joined Poll Merino ewes from Caltowie, South Australia. The ewes weighed 74kg and were mostly score 4 in condition. Wether lambs at Jamestown sold from $76 to $122, averaging $102. The top price was paid for 293 score 2 late January shorn Poll Merino lambs born in July/August 2018. They weighed 38.5kgs.